Please select an option California king Full King Queen Twin Please select a Size. 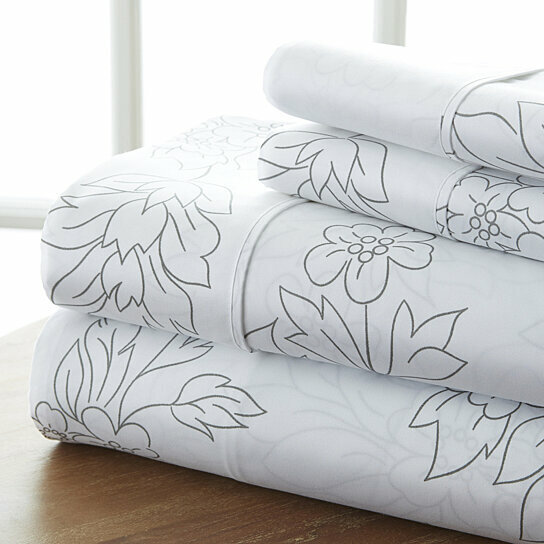 The Home Collection Premium Ultra Soft 4 Piece Vine Sheet Set is designed with your comfort in mind. Add a designer accent to your bedroom décor with this timeless Vine pattern artistically created to be a wonderful addition to any bedroom. Made of the finest imported double-brushed microfiber yarns creating a new standard in softness and breathability, this 4-piece sheet set will make it incredibly hard to get out of bed in the morning. Our premium yarns are two times more durable than cotton, completely wrinkle free, and perfect for all seasons. · 1 Twin Fitted Sheet: 39" W x 75" L +16"
· 1 Full Fitted Sheet: 54" W x 75" L + 16"
· 1 Queen Fitted Sheet: 60" W x 80" L + 16"
· 1 King Fitted Sheet: 78" W x 80" L + 16"
· 1 California King Fitted Sheet: 72" W x 84" L + 16"